We bought Bumblebee a laptop for his birthday, and it arrived today. He did his homework super fast on my computer while I set his up, and now he's set up a Facebook account. It's the start of a whole new era. Remember that blog post where I got lovely parcels of type wrapped in brown paper and said that I was working on a lovely book and promised to show you when it was finished? It's finished! We've decided to sell it from my website, so I've written up a promo page and set up a selling thingy in my Duckshop. That's a detail of one of the pages (the actual pages are longer in dimension); it's a really hard book to reproduce because the ink is a shimmery silver, and the images are for the most part, subtle and airy. It's not a cheap piece for the average punter, but in terms of limited edition books it's a pretty affordable publication, especially (and this is where artists' books are really weird financially) when you consider how much a Patsy Payne print costs as a single sheet (as much as the whole book!). We've all donated our time and energy to this book, as a fundraiser for the author, Sarah. She's been very ill over the last few years, and this is a gesture of artistic solidarity, I guess. 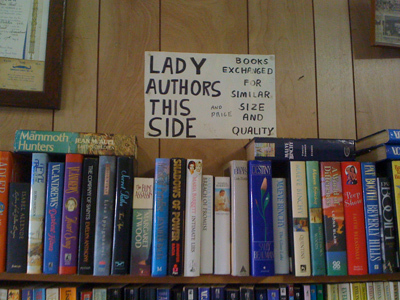 So all money goes to Sarah, and she can do what she wants with it (I think she's thinking about making a digital copy of the book so that her poems are more readily available). We will be launching the book in Canberra sometime in the next few weeks (I think), I'll let you know the details when they come to hand. It'll be a good chance to come & see the book in person, if you'd like to see more! In the meantime, one of the 16 copies is on show at the Libris Award exhibition at Artspace Mackay until 23 May. On Saturday, I took Bumblebee for a bit of a road trip, leaving Best Beloved at home with the kitties to get his essay done (he's studying to get the Extra Handy badge for his Public Servant merit sash). Our goal was his godmother's 40th birthday party. My friend Manthy was the first non-medical person to touch Bumblebee, and this was quite an unplanned thing; my mother (birth partner of choice) fanging it on the road to Canberra only to arrive too late, my father, in Canberra on business, too green-gilled to hold my hand, despite being officially licensed to kill (war being more palatable than birth, for some reason). We rang M, and she was there like a shot, bless her. Unfortunately, soon after she moved to Wollongong, and for a variety of factors, one of which is that both of us are self-absorbed artist-types, she hasn't seen much of B in the ensuing years. So I thought that this would be good for Bumblebee, in a variety of ways. We booked a cheap motel room, threw some odd bits of clothing in a shared bag, and drove to the Gong, ready for anything. Of course, the party was lots of fun. 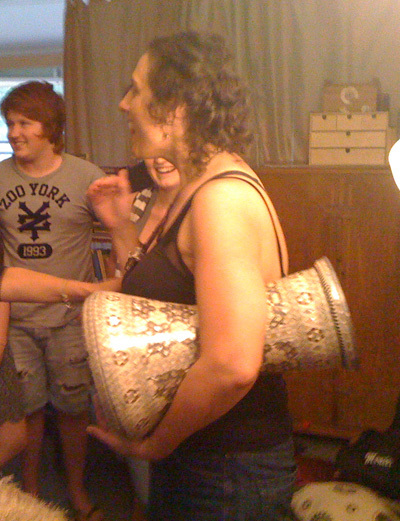 M is a musician, and teaches drumming and dancing, so the attendees were a lovely bunch of people who cheerfully helped make a no-dig garden as a birthday present, complete with accompanying gypsy-style music played live by those who brought their instruments. No-dig gardens are very easy to set up when you get all the ingredients and invite a large bunch of willing helpers to set it up. I'm quite inspired. 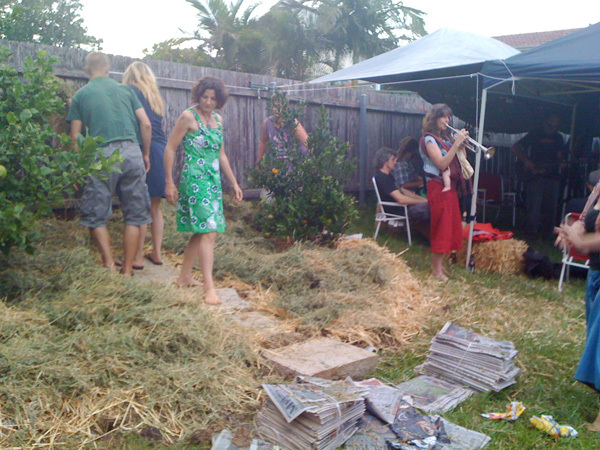 Here's the garden in progress, with musicians under shelter in the rear. More photos at flickr. The woman in the green dress is someone I hadn't seen in years. We shared a house together at university 20 years ago, and it felt like This is Your Life when I saw her (and another friend) walk in the door, looking just the same except with the same crow's feet I see every morning. It was fun to catch up. Here's a little video that has hardly any vision because I was sitting in the half-dark listening to everyone play later in the evening, and my phone doesn't cope with darkness. The main thing is the spontaneous music, played by people who jam together in different groups, but happened to be in the same space that night. I didn't know most of them, although I chatted to one fellow at some point, and he turned out to be a member of Waiting for Guinness, whom I enjoyed at Woodford one year. Manthy herself has a number of music projects on the boil at any time, one of which is called Mahri Autumn. She's just released an album under that name, and as a celebration of her birthday, I have two copies to give away to anyone who is interested. Have a listen on her website and decide if you like what you hear, and then email me (don't put it in the comments!) & let me know if you want one (don't forget your address). The first two emails will get a CD, but I'll only post to Australia, sorry. FWIW, my favorite song is Jack. It's my new jogging-on-the-treadmill song at the gym. Jack from Marianthe Loucataris on Vimeo. Enjoy. If you like it and I've already given away the CDs, buy one directly from her. I don't think it's in any stores. There was masses of delicious (mostly) Greek food, and birthday singing. Manthy sat through us all singing Happy Birthday to her, and then, in typical conductor style, made us all stop, hum in tune, and then made us do it again, drumming us through it. Classic M! Of course, while B enjoyed the gardening and running around in daylight, as soon as the sun went down, he & the other kids discovered that they all had gameboy consoles with them, and suddenly there was a game circle inside, playing together wirelessly, ignoring the adults and the pleas to join in with the music etc. Sigh. Yesterday we had brekkie on North Beach, drinking smoothies whilst watching old war planes circle the city for ANZAC Day, and then drove southwards to have lunch at Berry with my lovely aunty Sue (in torrential rain!) and then up the cliff face via Kangaroo Valley, into the (dry) Southern Highlands for a cuppa with Bernice (who lent me the new Brenda Walker to read, which I've gulped down overnight, and am determined to buy my own copy) and then home to a big lamb roast and Dr Who. Speaking of lovely greenery, I've been doing a fair bit of driving over the last week or so. 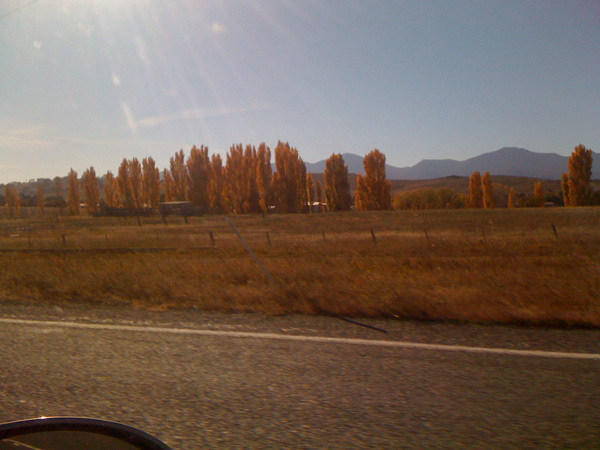 I went to Cooma to deposit Bumblebee with Colonel and Lady Duck, and all along the drive I saw the most magnificent golden leaves on the poplar trees, glowing in the sunshine along the roadsides. That shot (taken precariously whilst driving near Michelago) doesn't do the glory justice. I do so love Autumn. I also, in the last week, got my first and hopefully only GOLD TOOTH. Up the back, so I don't glint alarmingly when I smile, but I flash when I yawn. Apparently as a chronic tooth-grinder, gold is safer and will last longer under the pressure. The gold crown is covering a cracked tooth, probably from said grinding, so I really should do something to relax my jaw when I'm sleeping/working, the two main trouble times. Although how to relax further when you're already asleep is beyond me, really. I've run out of time tonight (probably because I keep checking my Scrabble/farm/city), but tomorrow I will come back and talk about Mahri Autumn, which is another thing altogether. Over the past few weeks I've been meeting really lovely people who read my blog. One such person came to the opening of 3 Chords and introduced herself* and then asked me how Bumblebee was going with school. Others were at Mackay, and there are always people who come up at things like the LifeLine Book Fair (WHICH STARTS TODAY PEOPLES) and shock the hell out of me, but it's to be expected, since I put myself and my loved ones out for show constantly. Today is Bumblebee's 13th birthday. I like to think I've managed to capture a few of the many moods of teenhood here. He's in his new beloved (and progressively crustier) uniform of black skinny jeans, a black suede waistcoat (a great bargain found at the Folk Festival) and his black Dunlop Volleys, teamed with a progression of fave t-shirts and his permanent hat. We (parents, grandparents) teamed up and bought him a laptop, which hasn't arrived yet, but I'm sure when it does he will start to develop his own distinct online presence. I've deliberately kept him from constant computer use, but it's time for him to immerse himself, at the recommendation of his teachers. Over the last few days I've given myself what can only be decribed as a minibreak, a phrase I've up to now disparaged as English pompompery to be found in movies like Bridget Jones. Why couldn't they just call it a weekend away, I've always sneered. But having 2 days anytime in the week where you can just ignore the world is definitely a minibreak, and a wonderful thing. Bumblebee and I had one day where we had a 'boyfest': we watched Iron Man and Clash of the Titans (one in our pyjamas, one in the cinema) and ate pancakes and choctops. The next day we did a chickflick fest and watched When Harry Met Sally and Sleepless in Seattle and ate pancakes and Chinese dumplings. I love the fact that he's enthusiastic about both genres. Today we are driving across to Harry's Discount Emporium in Fyshwick to check out his Star Wars stock and then we will poke our heads into the Book Fair. And then he goes to his Dad for the weekend, so, just like the day he took his first steps from his dad to me on an access visit, we both get to spend his first teen day with him. I can't believe I've stopped doing these...* it's been AGES, hasn't it? yes, that's something to bear in mind. 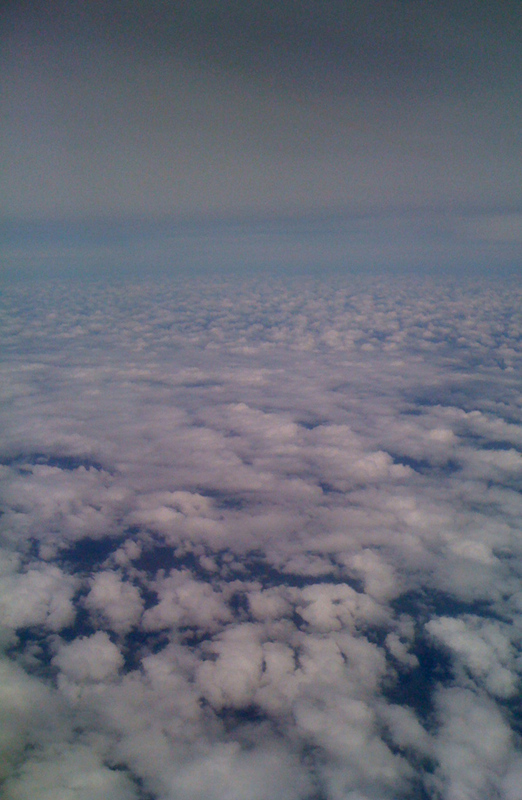 There are layers of cloudiness. *and I hate to admit it, but I was reminded of them by a photo in Who Magazine of Lindsay Lohan with her latest tattoo that says 'breathe'. Gah! After a high-octane day pumping out 25 original pages for a group book with David Dellafiora, I'm now stuck at Brisbane airport waiting for my delayed flight. I was meant to board at 7, but am now boarding at about 9. Bum. I'm completely shagged out, and am looking forward to a very quiet week with very little social interaction... I turned on my best performance for 5 days (and everyone was lovely today when I started to get a little bossy), but that's about the quota used up. Not that I get rude or anything, I just stop smiling so much and my brain gets very slow and vague. Poor old BB audibly blanched over the phone when I told him that the new pickup time at the airport was 10.30pm. He finds it hard to stay up after 9:30pm at the best of times, let alone in the grip of man-flu, so I've offered to get a taxi home. O, I can't wait to curl up under my doona with the cats! Cold weather! No moisture in the air! Still, it was a great week. Phew. It's over. I'm sorry I didn't blog over the last two days, but I was just rushed off my feet... I can't say that I took a back seat at this conference; quite the opposite, really, for better or for worse. On Friday, at my workshop, we had a clean paper day (we'd been messy the day before, doing monoprints) and I taught them a whole lot of sewing methods, plus shared a number of tricks & tips that always guarantee a happy group. By the end of the day we were like the Sisterhood of the Travelling Pants, even Doug, our token bloke. All weekend we kept hugging and talking and feeling very bonded. It was lovely and warm and fuzzy. 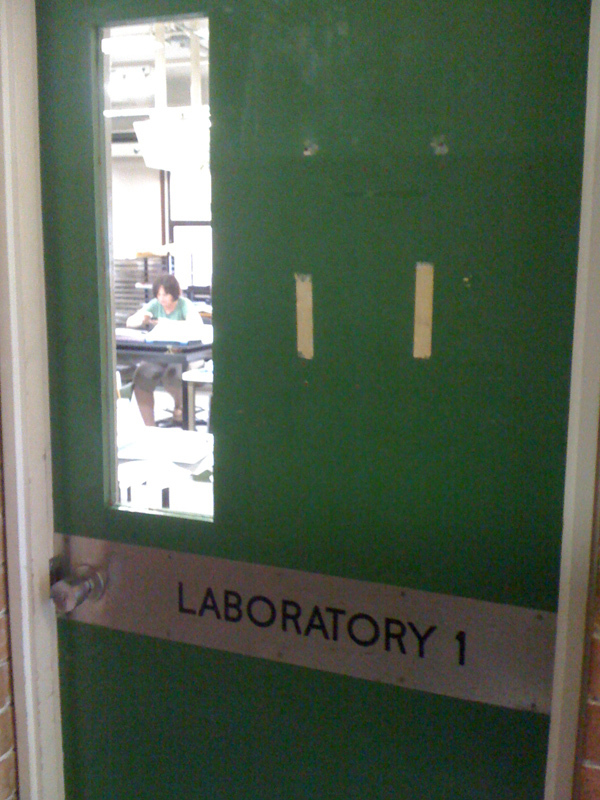 I wasn't sure if we were allowed to photograph the room, but there's no catalogue or even a list of works, so I went around and took some (flashless) room-view photos and they are up at flickr. It's an absolutely stunning show, photos don't do any justice to it. The whole weekend was spent meeting and greeting; at the opening I met two members of Book Art Object, one, Sara, I've spent time with before, but the other, Dinah, was brand new, and lovely. I'm sorry they couldn't stay for the whole conference! I went out to dinner with a group of friends who included a printmaker I've admired for a while, and who, during the course of the dinner, agreed to work with me on a book project next year. Hooray! Then I dashed back to my serviced apartment to keep working on my conference paper. I spent both nights on it (last night I worked until 1am, just trying to get certain bits to make sense!). The first day of the Conference seemed to be all about the boys. All the speakers were men, and many of the topics seemed to focus on conceptual and ephemeral works of the 1960s and 1970s, when books tended to be blokes telling people what to do and how to see, even though they thought they were encouraging people to think outside the square. There were a few gorgeous papers, especially one by Perth artist Paul Uhlmann that spoke eloquently about the book as body, among other things. Glenn Barkley walked us through his amazing 2009 exhibition at the MCA, Avoiding Myth & Message, where he combined poetry and artists in a very different way. The dinner that night was, sadly, very disappointing. 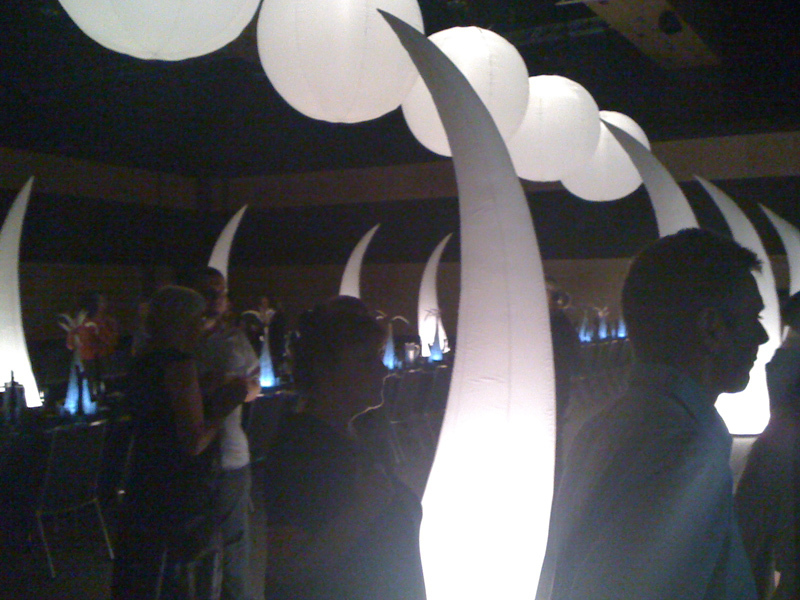 The decoration was wonderful: there were huge inflatable 'tusks' that gave the impression that we were eating in the belly of a giant beast. There was a talented musician, whom we really enjoyed, but the food was quite hit & miss. It had been an expensive dinner; as a speaker, I didn't have to pay for my meal, and I'm quite glad. Alcohol was not counted in the dinner fee, had to be paid for on top. My neighbour at the table, who was a vegetarian, had paid to be there and her main course was a bed of rice with some sweet potato and spring onions on top... while I was eating a thick slab of very tender beef with a very cloying red wine sauce. Dessert was a large glass of white choc mousse, so rich that none of us could finish it. It was a bit sad, because all the rest of the catering through the weekend was very good and very thoughtful. One of the frustrating things about the conference was the absence of question time. I thought it was being saved for the end of the day, but there was never any time to discuss the ideas except over the (quite long) breaks, but it wasn't the same, because most people wanted to catch up or look at books in the breaks. I'm one of those people who decides to do something about things people are unhappy about. Or I'm that person at a meeting who, when someone has said 'we really need to do this, and then an awkward silence falls as everyone looks down at their pen, goes 'Oh f**k it, I'll do it'. So one of the reasons I sat up late last night tweaking my paper was to make it a bit firmer and less flabby so that I could finish early and insist upon question time. So I did. The two women speaking before me (this whole day, all the speakers were women except one) had given fantastic talks, one about her work about Poland and the holocaust and the process of making a digital version of her exquisite book, and the other about her incredible second life on Second Life as an artist and book maker. The group was gobsmacked by what is happening on Second Life and the fact that Judy makes more money as a virtual artist than she does as a real artist, plus the things that virtual books can do in that environment. So I did my talk (I'd tried to make it as entertaining as possible, and it seemed to work judging by the laughter in all the right places), and then I asked for questions; we had a good fifteen minutes of discussion about what we'd all said that morning. Susan Wood, talking after me about really interesting ideas of art group dynamics and the future of the book (not at the same time), did the same thing, and by lunchtime we were all very satisfied, having had a chance to communicate as a group. A bunch of short artist's talks later, it was all over, and I'm quite tired. I've had a lot of good conversations, picked up lots of business cards of interesting people, bought a print, and talked up a few books I want to sell. Oh my goodness, Mackay just put on a fireworks display that I could see from my balcony! I have no idea what the occasion is (it wouldn't be our tiny conference) but it was quite spectacular, mostly for the hundreds of shrieking parrots flying around me in a panic as the gunpowder popped and flared in the distance. Mackay is so flat the fireworks would have been seen for miles. Tomorrow I'm going to participate in a workshop by mail art obsessive David Dellafiora who runs Field Studies Collective, and we're going to made a group book called Bound in Yellow, where we get to explore the 19th century use of yellow as a metaphor for decadence and madness. Yummy! Yay, my dongle is dongling! I am an independent websurfer, free from the restraint of overpriced timing... and yay for salt & vinegar Samboy chips and a tonic water, the essence of kicking back in north Queensland. It would be something alcoholic if I were drinking at the moment. Of course, the first day of the workshop went well, in my usual let's-wing-it style: throw ideas and choices at them, watch them reel while they have a quick cuppa, and then let them loose at a heap of materials and coax them all to make something they've never tried before. I'm happy if each student can have a Eureka moment once in the two days of the workshop, and I got at least four today, so I have to try harder to get the rest happening tomorrow. 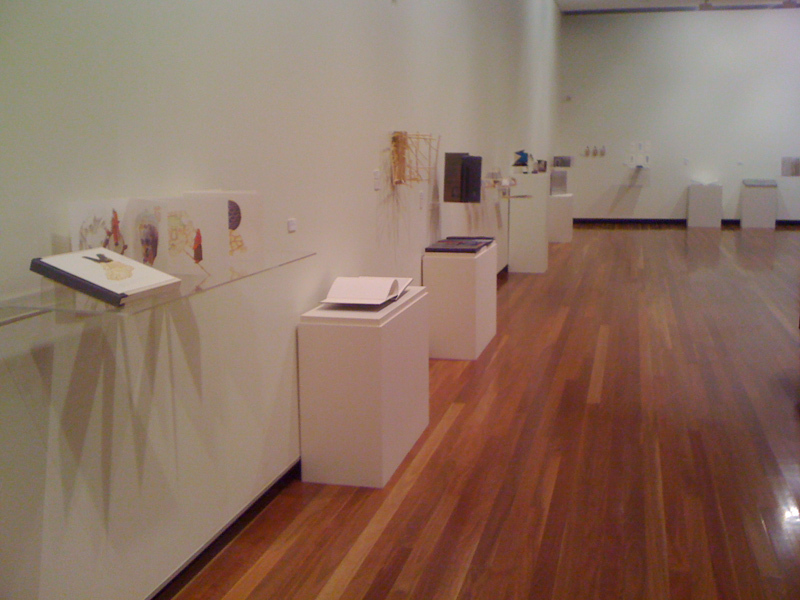 The exhibition for the Libris Award is being hung today and tomorrow, and it looks AMAZING. Jam packed with interesting work by interesting people. 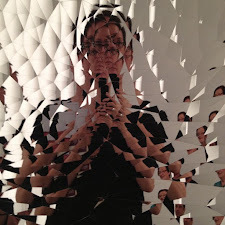 I will do my best with my crappy iPhone camera to capture some of it at the opening tomorrow night. 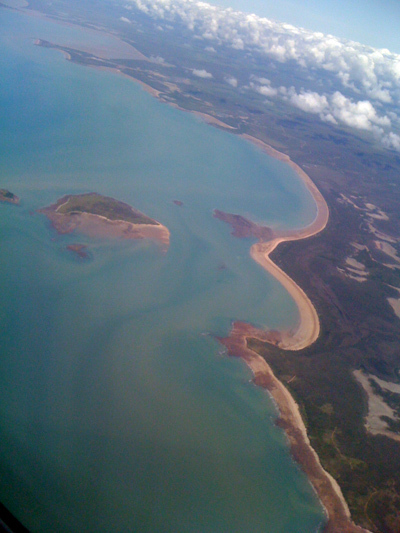 Flew into Mackay yesterday -- fantastic views from the plane window, and each leg of the journey was uber-fast, meaning, I guess, that the winds were behind us. I didn't have to wait long between flights, maybe 15 minutes, so it was a lovely morning. I was picked up at the airport and whisked into town to my serviced apartment at Quest Mackay. It's a studio apartment, so there's a huge bed, a small kitchen, a tv and a bathroom. What more does a girl need? Internet connection. It does have it, but the prices are exorbitant, so I went for a walk around and found somewhere to buy a dongle (something I've been meaning to do for ages). and hanging out in Caneland (mall), and then the rest of it got sucked up into dongle-problem-land. I made many calls to Indian help centres, I waited the requisite 20 minutes each time for things to activate, I got told to check my email for passwords when I had no internet access (!) and I got cranky as hell. And then we worked out that the sim card that came with the starter pack was damaged. Of course, this was worked out after business hours, and now I have no spare time within business hours, since my workshop starts this morning on the other side of town from the shop. Sigh. So I'm using the Quest internet access after all, with a useless dongle sitting limply on the desk beside me and a wealth of double entendres at my fingertips. Today I'm starting my Masterclass, called Print to Book, and I'm suitably nervous... how can I presume to know more than a bunch of other book artists? I'm sure it will be buckets of fun, but I can never help having nerves beforehand. I haven't finished my talk yet either, for the same reason. I was almost there, but then got the brain wobbles about what I was actually trying to say, so I sat down last night and kept rewriting. I've written the first two thirds over and over, but the last third is still very larval. I'm not giving the talk until Sunday, so I have time... I hope! Did I mention that I had a partial crown fitted to one of my back molars on Tuesday before I left? It feels so strange in my mouth, and is still quite tender (I have a cracked tooth). It all adds to the oddness of being away from home, an oddness I really enjoy. But if you want to see photos from the 3 Chords show, I've put them here. Still, I managed to survive Bumblebee's sleepover last night, when he & two friends spent the day at the Folk Festival and then 'slept' in a tent in the back yard (lots of giggling, pillow-fighting and game-boying): I've been writing furiously, I've packed my clothes for the Mackay trip, and I've managed to see a few things at the Folk Festival. The tribute theme this year is Motown, and I got to see Carl Pannuzzo do a Stevie Wonder cover with only a ukelele and it was the most amazingly marvelous thing. So I'm doing alright. 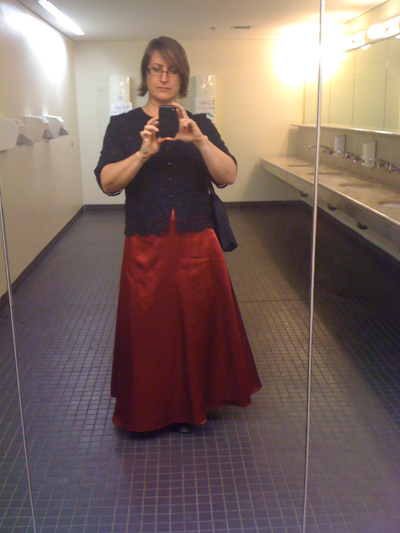 This is me, taking a self-portrait in the toilets of the National Gallery of Australia, the one chance I had to photograph what I was wearing before I trashed myself at the wedding we were attending (we'd got dressed in a bit of a rush). The skirt is Zoe's, the black lace top something I found in Vinnie's years ago. The wedding was lovely; the bride wore a full-length and tulle-filled red tartan number with bright orange hair, and we got to swan through the Paris exhibition in black tie rather than sit through tedious speeches. 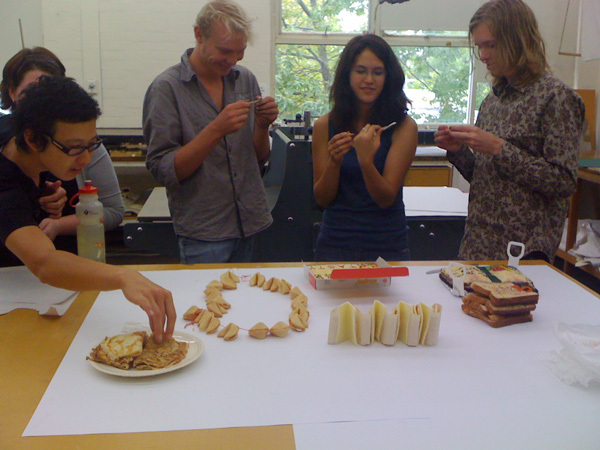 My students enjoying our edible book tea-party. For more edible book shots, go here. My contribution to the tea party: I call it a neckoracle. 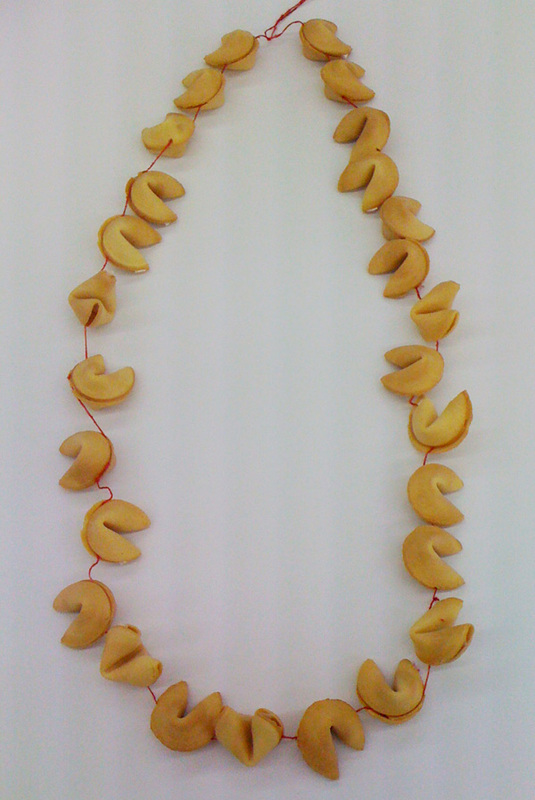 It's edible, wearable and readable... once eaten, the fortunes get rethreaded on the string to make a second version of the 'book'. 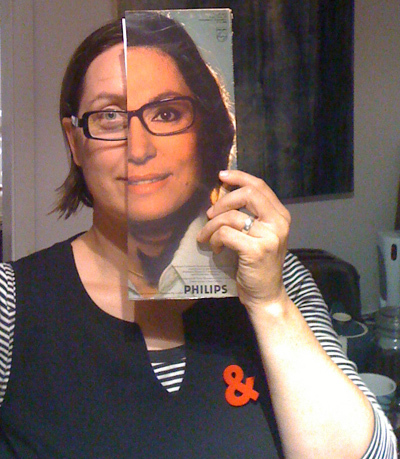 No photies of the exhibition yet, have had no time to take them... but here is I, pretending once again to be Nana Mouskouri. Narelle, the Gallery Officer for ANCA, made a clever zine-like catalogue for the 3 Chords show in which she cut up chunks of album covers to be covers for a concertina-fold price list & statement sheet. I nabbed the NM one instantly, and Byrd helped me laugh at myself once again.